Third molars, also called wisdom teeth, are the last teeth to surface, usually between ages 17-25. Most people have four wisdom teeth, some don’t have any, and in rare cases people have more than four. 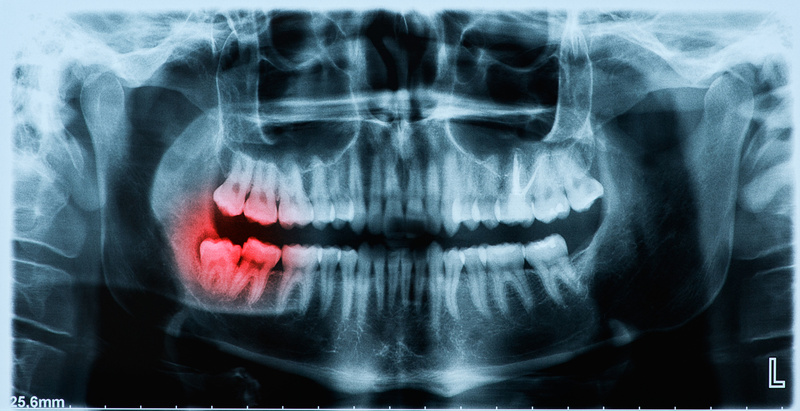 Your dentist observes your wisdom teeth with x-rays as part of regular examinations. The American Association of Oral & Maxillofacial Surgeons estimates that 85% of wisdom teeth will eventually require removal. Wisdom teeth are often impacted – not properly emerged through the gums, instead growing crooked or even completely sideways. Left untreated the impacted teeth can cause a host of problems including crowding or misalignment of the other teeth and jaw, headaches and infections. Even if not impacted, wisdom teeth can be difficult to clean and may require removal to reduce the risk of decay and infection. The best time to remove wisdom teeth is when the patient is in their late teens-early 20’s, according to the Canadian Association of Oral & Maxillofacial Surgeons. Surgeries performed later in life can still be very effective, but healing may be slower, and the risk of complications slightly higher. Wisdom teeth extraction is performed under local or general anesthetic and does not require an overnight stay.